One of the top prospects in the nation. Stanley has proven that he can dominate against any competition. He is one of the most athletic players that one will see at the high school level. Stanley is fantastic in transition. He can score in a variety of ways and he sees the floor really well. Early in his high school career, Stanley has also been a very good defender. He has scholarship offers from USC and UCLA. Stanley already projects well to the next level. Whitney might be the best freshman in Chicago and he is at Solorio instead of one of the powerhouse schools. Whitney's arms seem to reach lane line to lane line. The freshman can jump out of the gym. His athleticism is his biggest strength right now, but it certainly isn't the only one. He is a good ball handler that can make defenders look silly. If the defense gives him space, Whitney is a capable outside shooter with a high release and strong follow through. Whitney has showcased special skills so far at Solorio and he is just scratching the surface. A part of the Ball trio of brothers that have Chino Hills as the top team in the country. Ball committed to UCLA before playing a high school game. He is having a strong freshman year. Just like his brothers, Lonzo and LiAngelo, LaMelo passes the ball really well. He understands the game well beyond his years. LaMelo just turned 14 in late summer. Also like his brothers, LaMelo has an unorthodox shooting motion but it works. He is poised for a stellar career. Iowa City West is a talented team and an extremely deep team, so McCaffery's numbers aren't eye-popping at this point. He is playing efficiently to begin his high school career though. He's averaging a handful of points along with three rebounds and two blocks per game. There's nothing that the younger McCaffery can't do on the court. He hasn't shot well from the outside yet, but that will come as his sample size increases. McCaffery passes the ball really well and he moves without the ball at a high level. He will be a fun player to watch over his high school career. The son of former NBA player Greg Anthony, Cole Anthony is living up to the hype early in his career. He might be the best freshman in New York right now and that is always a lofty statement. The vision, feel and athleticism is there for Anthony to develop into a major player and prospect. There are few players with the current skill level of Anthony along with major potential. He has it. Clements is seeing playing time as a freshman. That is a rare occurrence at the Chicago powerhouse of Simeon. Clements has really long arms that help him on both ends of the court. He also has excellent speed off the dribble. He is a poised player that played well against Whitney Young at the Chicago Elite Classic. Clements is a guard to watch progress in the 2019 class. The lead guard on one of the most talented teams in the country. Campbell has been the straw that stirs the drink for Shane Heirman's squad. Campbell's best attribute is his passing ability and that is perfect with Brian Bown, Brandon Cyrus, James Banks, Jeremiah Tilmon and others. He knows when and how to get the ball to each player on his team. He is a good mid-range shooter right now and his range should extend down the road. Campbell is having a very strong freshman year. Leech is having a great start to his freshman year. He is averaging 20 points, four rebounds and three steals per game. He is shooting 47% from three point range eight games into his high school career. Leech is a long lefty that shoots the ball well off the dribble. He loves to shoot step back jumpers over defenders. He is also athletic enough to get around defenders off the bounce and finish at the rim. Leech's explosiveness should continue to improve as he gets stronger. That will be a nightmare for opponents and a dream for high-major coaches. There aren't too many players with the tools of Bryan Antoine at this early age. 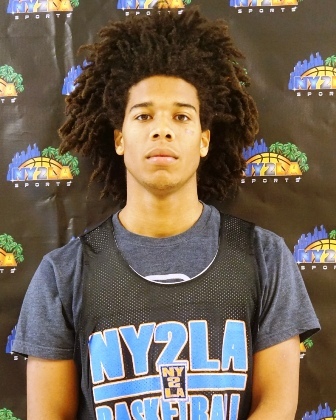 Antoine is a long, lanky guard that has excellent athleticism. He has speed while handling the ball in the open court. He is also agile with dribble moves when defenders try to stop him. Antoine is not just an athlete. He is a good shooter from the outside when he has space. Antoine is best when he is getting to the basket though. He is a smooth finisher around the cup and he will flush it in transition. He is a player that is excelling now and has a bright future as well. Thompson scored 19 points in a loss to Carmel to start his high school career. His Zionsville team has now won seven straight games and the freshman is scoring 20 points a game. He is shooting 40% from three point range and 87% from the line. His playmaking will continue to improve as the game slows down for him. He has dribble moves and quickness. Right now, he is using that combination to score. Down the road, it will be more balanced between setting his teammates up and scoring himself. Thompson has a bright future.